(I decided to write this post because I'm planning to branch out into historical social topics more frequently - but it lines up very well with an event this week! I will be attending Death Becomes You at the Metropolitan Museum of Art on Halloween, in a post-Edwardian black wool dress with white collar and cuffs. Hope to see you there! The subject of mourning is a very popular one when it comes to the mythology of the Victorian period. Traditional rules of mourning, however, go back further than Prince Albert's death, Victoria's reign, or even the nineteenth century. The concept of mourning in specific clothing is very, very old, but to focus specifically on Western European codes involving specific styles of dress, stages of intensity, and periods of time, a mourning code including concepts of first and second mourning extends at least as far back as the 17th century. Samuel Pepys noted in his diary that Anne Hyde, the Duchess of York, was in second mourning for her mother in "black, edged with ermine" four months after the death, and third and half-mourning followed second (though third seems to have dropped out of usage by the mid-18th century). While these were generally successive dress codes meant to transition a person out of deepest mourning, half-mourning was also a primary stage of mourning worn for more distant relations. Providing mourning for servants was a status marker due to the financial outlay required, and Continental sumptuary laws of the time often forbade it. In Mary Wortley Montagu's account of the Austrian court in 1716, she described the constant mourning worn by Princess Christine Louise of Oettingen-Oettingen, the mother of Empress Elisabeth Christine, and noted that "nothing can be more dismal than the mourning here, even for a brother," indicating the existence of different standards for different relationships between the mourner and deceased. In the same year, Louis XV (or his regent) cut the required lengths of mourning times in half, so that full mourning only lasted six months, "and the rest in proportion". France had a similar system of mourning levels, at least by the 1720s, in great mourning (grand deuil) and lesser mourning (petit deuil): great mourning consisted of a totally unornamented outfit of black wool, worn with a long cloak and a band of crêpe around the hat, widows adding a black crêpe veil, while lesser mourning was made from serge or crêpon (a heavier silk or wool crêpe) and made use of blue and white ribbons as well as black. Widows, their clothing financed by the estate's heirs, were expected to take a year of mourning in which they did not remarry, out of respect for their husbands, but at this time the prohibition against quick remarriage was much more important than actually wearing mourning clothes during the full year. Outside of court mourning for a member of royalty, great mourning dress was only expected to be worn for a deceased parent, grandparent, parent-in-law, sibling, or spouse; mourning for one's descendants was supposed to only include the long wool cloak, while a short cloak or petit deuil were worn for uncles, aunts, cousins, nieces, and nephews. In the middle of the century, a complete guide to the stages of mourning was published (and later reprinted in a shortened form in the Galerie des Modes), said to have been the same since Louis XV changed the periods of mourning. The grand deuil consisted of three stages (wool mourning, silk mourning, and petit deuil), required black drapery to be put up in the house, and prohibited the wearing of diamonds and swords, while a less formal type of mourning had only two stages, black mourning and white mourning. Grand deuil was extended from the earlier relations to include aunts, uncles, and cousins; black and white mourning was worn for second cousins. French tradition also required that inheriting siblings of the deceased wear mourning three times as long, which did not happen in England, but the other mourning periods were likely the same in both countries. Wives did wear mourning twice as long as their husbands, for just over a year, to correspond with the required period of single widowhood - but only the first four and a half months were in the fullest mourning. Kings were treated as fathers of the country in their general mourning; court mourning followed the same rules as ordinary mourning, but carried out in court dress. This tract was published in the 1780s in translation in England, with a note at the end that the reader could see similarities between French and English mourning. A general deep mourning in England lasted three months for the death of Frederick, Prince of Wales in the 1750s, as did second mourning after that. Court mourning on the same occasion consisted of black bombazine gowns for women (dark Norwich crêpe while in undress), with black crêpe hoods, "plain muslin or long lawn", chamois shoes and gloves, and crêpe fans; gentlemen wore black wool coats (dark grey in undress) "without buttons on the sleeves or pockets", cravats of muslin or "long lawn", weepers, crêpe hatbands, chamois shoes and gloves, and black swords and buckles. 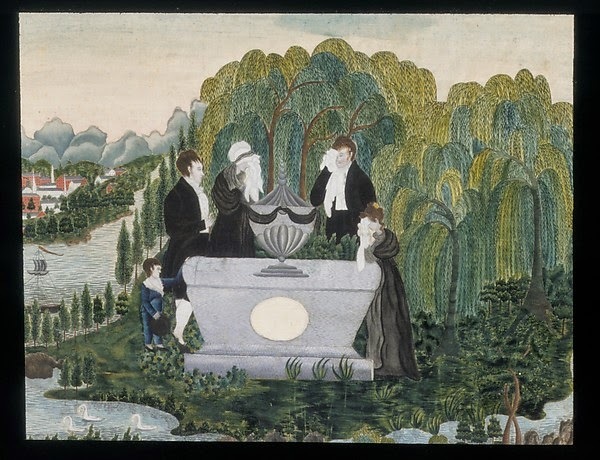 The second mourning was, for women, black silk gowns (white or grey in undress, of lustring, taffeta, or damask), plain or fringed linens, white gloves, necklaces, and earrings (without diamonds), and black and white shoes, fans, and tippets; for men, fully-trimmed black coats (grey frock coats in undress), plain or fringed linens, black swords and buckles - the same as was ordered in 1737/38, on the death of Caroline of Ansbach. A more middle-class mourning would likely have been fairly similar to the court undress. 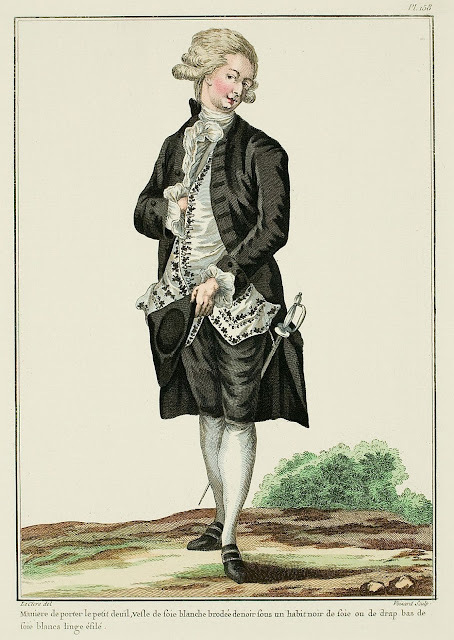 "Weepers", flat white cuffs, were worn by men just for full mourning, as were crêpe hatbands; bombazine was clearly very commonly worn during mourning, as was wool crêpe. In hotter colonies, men's mourning coats were only ornamented with black cuffs and buttonholes. Women frequently wore all white with plain linens and ruffles for second mourning, and sometimes all black with striped or otherwise ornamented linens; men's second mourning often was grey trimmed with black. Mourning rings were falling out of use, distributed mainly to tertiary figures: will executors, religious men, and servants. As in France, providing mourning dress or the money to buy it to one's heirs or dependents was a significant issue. One half-mourning for men in the same year was described as a black cashmere coat (rather than black wool), a black-spotted and -bound white waistcoat, and white "trowsers". This was followed by the remark that it was unjust to require such mourning for relations but deny bereaved friends the ability to dress in mourning as well. These mourning periods are increased for parents, siblings, and aunts and uncles, but decreased for the rest, and it sounds as though first, second, and half-mourning were worn as the sole stage of mourning rather than successive stages. 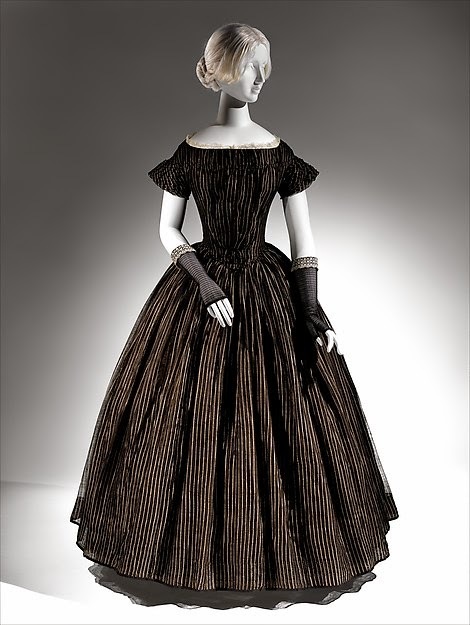 Black gowns could be worn even outside of mourning; one English 1849 etiquette manual suggested that mourning worn to balls be indicated with scarlet trimming, so that women in black outside of mourning could trim with any colors. However, American authors maintained that one in mourning should not attend balls at all. Etiquette books had been written since the eighteenth century, but production increased during the nineteenth. While fashion magazines give us very detailed information about what garments were acceptable, they are less informative on the subject of other mourning customs. Visiting cards of someone in mourning were to have a thick black border while those for half-mourning would have a narrower one; black sealing wax was to be used during both. Making visits of condolence was a new custom in England (at least) in the 1850s, requiring a mourning card of one's own to be sent up, and women to dress in black silk or another plain color. 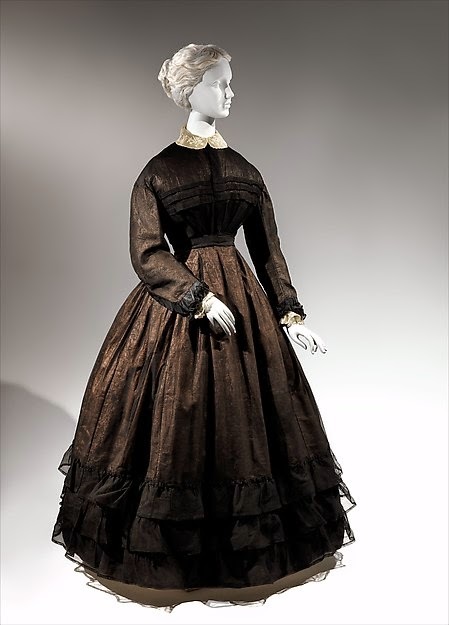 In the 1860s, the description of mourning customs, including dress, increased and became more detailed. This is generally attributed to a Victorian "cult of mourning" proceeding from the death of Prince Albert in 1861, but many of the customs may have already been in use: the stages of mourning dress, so often represented as a facet of uniquely Victorian repression, were clearly of an earlier date. It seems likely that the other customs may have been in use, and were only coming into print in the mid-Victorian era. In actuality, there was a Victorian cult of etiquette books, especially in America. And English mourning customs of the time were fairly simple. 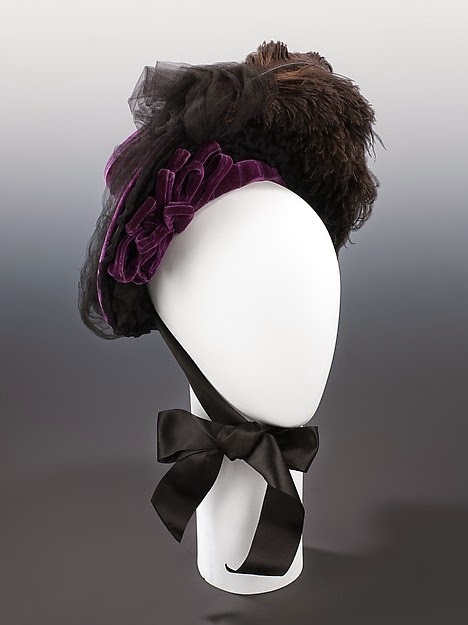 Widows wore "widow's cap and crape" for a little more than a year, and could then transition into either half-mourning or no mourning; a widower's crêpe hatband would almost cover the crown of his hat and gradually be reduced. As in France, mourning for parents would have crêpe trim for six months and no crêpe for six months, while hatbands would come within two inches of the top of the crown. Brothers and sisters would get six months, and aunts, uncles, and cousins three, with proportional hatband levels. Complementary mourning worn to visit someone in mourning would be black without any crêpe. These standards were to last until the end of the century. French mourning was rather complicated, in contrast (although many of the specific traditions, such as the placement of the crêpe bands, may have been shared across the Channel and assumed to be understood by readers of the previous sources). 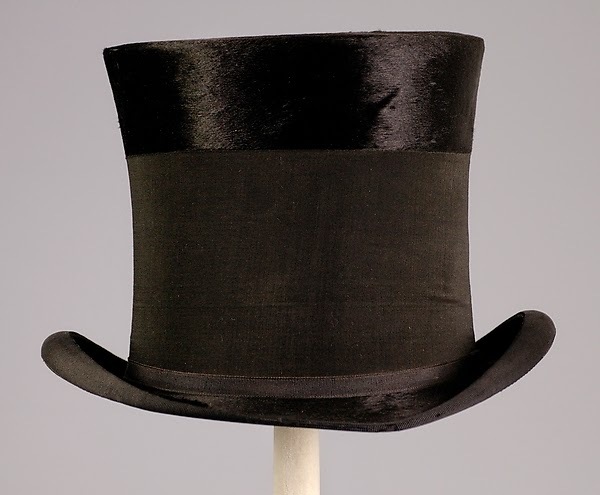 Like Englishmen, male mourning was entirely black, with a wide crêpe band on the hat. Widows wore the deepest mourning: a paramatta skirt with a single bias band of crêpe, a bodice trimmed in crêpe with sleeves cuffed with crêpe, a cloak of "widow's silk" trimmed with bias bands of crêpe, and a veil of a light wool or silk fabric. After nine months, the widow could change the wide crêpe band on her skirt to two narrower ones; after a year, wear silk trimmed with crêpe, jet, and beaded fringe; after three more months, she could stop wearing crêpe; after three more, she could leave off the veil and being to wear grey and violet. (The text goes on to imply that this is actually English mourning practice, and that French widows could wear grey and violet after a year and six weeks.) Mourning for a parent was only slightly less serious, with crêpe worn over wool for three months and over silk for three more; white could be worn as a flat collar or plain sleeves, and after those six months as fancier collars and sleeves. In two more months, she could wear grey gloves and gold jewelry, and then half-mourning for two more months. Siblings received a slightly lighter mourning, with three strips of crêpe on the skirt, which lasted for a year. For a grandparent, she would wear a little crêpe for three months, no crêpe for three more, and then half-mourning for three more. Uncles and aunts received two months of black and a month of half-mourning; second cousins, three weeks in black and three weeks in half-mourning. In town, one's equipage would be in black drapery, and everywhere one's servants would be dressed in black as well. Purses and cases of all types would be black during full mourning and grey or violet in half-mourning. By the end of the century, the stages of mourning had diminished to two, grand deuil and demi-deuil, each generally being used for half of the mourning periods, and changed the time periods more drastically to come into line with English practice, although there continued to be a separate standard for mourners who had inherited from the deceased. In the United States, there were no requirements for the length of the mourning periods. Those of England and France were given in American etiquette books as potential guides, but did not have to be followed for respectability. 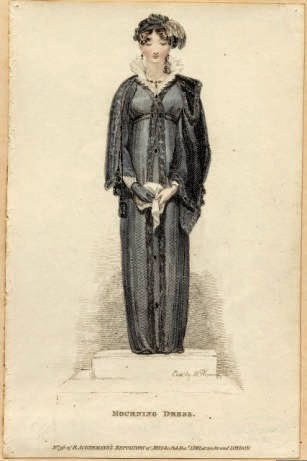 The clothes for the different stages were similar to those of England: for deep mourning, traditional wool/wool blend fabrics (which multiplied to increase choice for mourners and profits for drapers) with crêpe, eventually lightened to lusterless silk; second mourning, black silk, purple, lavender, dark grey, and white, lightening to lavender with white accessories as half-mourning. American etiquette books continued to maintain that there were no required time periods until the end of the century and also continued to provide suggestions (some rather extreme, such as eternal or two years' mourning for a widow - however, the books frequently remarked that mourning periods were shorter than they had ever been). After the turn of the century, the rules began to change. 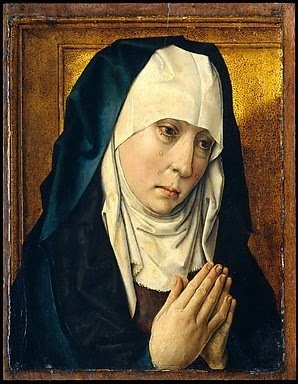 The widow's crêpe veil could be replaced by one of nun's-veiling, worn off the face; periods could be simplified, with mourning for immediate relations for a year, and for in-laws, three to six months. All white could be worn in full mourning. Black armbands worn over tan coats were evidently becoming common. After the end of the first World War, mourning continued to simplify. Three months was sufficient for uncles, aunts, and cousins, while grandparents and in-laws no longer required mourning. Even widows wore less mourning, being able to shorten their periods down to three months of deep mourning and six of half-mourning, and when the books came down to it, all mourning periods were at the discretion of the wearer. Etiquette books were still prescribing the same long periods of mourning and social seclusion in the 1920s, for both women and men. While they had always made references to those who left off mourning too early, the later books' lengthy emphasis on "sloppy" or inappropriate dress while in mourning seem to be based in a widespread social change, an increasing impatience with long or very plain mourning. The concept of levels of mourning continued through the 1940s, etiquette books agreeing that months of black, transitioning into black and white, and then lighter colors were appropriate (while being sympathetic to those not cooperating with the scheme). It was not until the 1950s that the rules were completely abandoned. 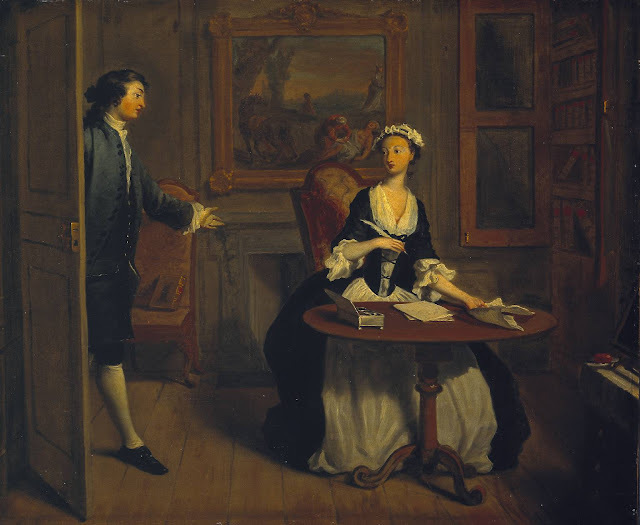 The point of wearing mourning, as summed up in the mid-eighteenth century etiquette book The Young Gentleman and Lady Instructed, was to prevent one from having to wear distressingly cheerful clothes while grieving, and to represent that grief to the rest of the world. Today, mourning rules are often seen as social laws that forced people - especially women, given that widows dressed in it the longest - to repress themselves and miss out on life. As with corsets, I lay this idea at the door of Gone With the Wind. The scenes in which Scarlett, who never loved her husband, feels trapped by the mourning she's forced to wear and resents having to refrain from gaiety are well-known. The need for etiquette books always represents that people are not behaving in a standardized fashion as the books suggest. If they were routinely wearing mourning as long as the etiquette books ordered and in those fabrics, there would have been no need for such detailed descriptions. The social stigma of a nineteenth century widow wearing deep mourning for only nine months rather than a year, for example, might not have been generally seen as disrespectful. In fact, it was often held that following the rules of mourning behavior was meant to follow one's desire to mourn, that continuing a show of mourning after one wanted to rejoin normal life was undesirable or hypocritical, and that outsiders should not judge mourners for not behaving fully in line with the rules. Mourning etiquette was also not just created to restrain the behavior of the bereaved into accepted forms of grief. Etiquette books instructed their friends in polite manners toward the bereaved as well, in order to be sensitive and sympathetic. Complimentary mourning, worn for relationships that did not require a specific mourning period or depth of mourning, allowed people to express their sympathy for those who had lost a parent, child,or sibling. Some recommended that, in order to signal the end of their mourning, the bereaved should send their cards (presumably without black borders) to their friends; others suggested that "no invitations of a gay social character" be sent to the bereaved until after three months of mourning, allowing them to decide when they were ready to accept. It's very easy to look at historical mourning traditions as a distant and strange expectation, but the population of the past did not have the same expectations and standards that we do today. The idea of dressing fully in black for some months was normal, something that everyone would have experienced from a young age. It is difficult to imagine from our perspective, but it is also difficult to imagine living at a time when mortality rates were so much higher. I'll see you at the Met! I'll be in half mourning, Natural Form, hopefully. I'll keep my eye out for you! Interesting post! Love seeing the variations over time. And agreed about incorrect interpretations of repression to this practice. I've heard many people say they wish we still held to these conventions--wearing mourning is a clear signal to those around you why you may be less participatory, cheerful, or approachable than usual. We get so wrapped up in wanting to apply modern sensibility to the past (how repressive!) that we forget some of the benefit of everyone "speaking" the same etiquette language. Thank you! The changes over time have been niggling at me since I translated that GdM post on the stages of mourning, as much of it sounded like things considered solely Victorian. So it felt nicely fulfilling to research what was considered necessary in different periods. I can understand why the initial contemporary reaction is that it was basically a punishment, but it's so interesting to read the contemporary perspectives in the etiquette books! You don't have to feel awkward in bright colors, people are supposed to leave you alone ... and with a veil, nobody can see you've been crying.